* By E. N. da C. Andrade; reprinted by kind permission from Obituary Notices of Fellows of the Royal Society, Vol. 4, 1943, pg. 277-292. The original is followed by 8 pages of bibliography of Sir William Bragg's papers. In the late 'fifties Robert John Bragg, a young man of twenty-five, retired from the sea, where he had been serving as an officer in the merchant navy, and purchased with some moneys that had been left to him the farm called Stoneraise Place at Westward, near Wigton, in Cumberland. Here he settled down to a farmer's life. In 1861 he married Mary Wood, the daughter of the Vicar of the parish of Westward, and the next year, on 2 July 1862, William Henry Bragg, later to be President of the Royal Society, was born. * The family has very kmdly placed them at my disposal. They were mainly written about 1927, small additions having been made in 1937. In 1875 he left Market Harborough for King William's College in the Isle of Man. 'The place was a very healthy one and after the first year or two, when the bullying was rather unpleasant, I was happy enough. I stood high in the school and liked my work, especially the mathematics: and fortunately I was fond of all the games and played them rather well. So, though I was a very quiet, almost unsocial boy, who did not mix well with the ordinary schoolboy, being indeed very young for the forms I was in, I got on well enough.' He rose to be head of the school. Early in 1880, when he was seventeen, he went up to try for a scholarship at Trinity College, Cambridge, and was awarded an Exhibition: he was considered rather young and advised to go back to school for a year. The following year he tried again and did not do so well, but was elected to a minor scholarship on the strength of his previous performance. In his notes Bragg puts his 'stagnation' down to a storm of religious emotionalism that swept through the school - the boys were scared of eternal damnation and of hell fire, and very much exercised as to what they should do to be saved. 'It really was a terrible year', says Bragg, who, though essentially a religious man, adds, 'But for many years the Bible was a repelling book, which I shrank from reading.' This from his private notes, but the period evidently left a strong mark on his mind, for in the Riddell Memorial Lecture on 'Science and Faith', given in the year before he died, he says, 'I am sure that I am not the only one to whom when young the literal interpretation of Biblical texts caused years of acute misery and fear'. What he says in this lecture should be in the hands of all those who have to deal with susceptible adolescence. Bragg was much elated. The salary of £800 a year, a very respectable income in those days, was much beyond what he had expected at his age, and the thought of going to a new country and being his own master excited him. His relations were delighted, in particular his Uncle William, who had always helped him and was very proud of his academic career, although the parting was a great blow to the old man. Bragg enjoyed the voyage out, and was fond of telling in after life how he spent part of his time on the boat in studying physics. The post was that of professor of mathematics and physics, and Bragg was wont to declare that, at the time, he had not studied the latter subject and knew nothing of it. The electors apparently attached little importance to his inexperience in this respect, and supposed that he would pick the subject up as he went along. At any rate, he read Deschanel's Electricity and Magnetism while outward bound. Apparently the demands on a professor of physics were not very high in those days. The life in Australia delighted him from the first. 'Going to Australia was like sunshine and fresh invigorating air,' he wrote. He at once made friends all round, particularly with the Todds. Charles Todd, the head of the family, was Postmaster General and Government Astronomer of South Australia; he was elected a F.R.S. in 1889 and later became a K.C.M.G. In 1889, three years after he landed, Bragg married his daughter Gwendoline. The three children of this very happy marriage were born in Australia - William Lawrence, the present Sir Lawrence Bragg; Robert, who was killed in the Dardanelles during the First World War; and Gwendolen, now Mrs Alban Caroe. Bragg's simple, modest, unaffected nature, which had rendered him shy in the conventional Cambridge surroundings of those days, expanded in the free, open, good-natured atmosphere of Adelaide society, which, he said, was a revelation to him after the more formal life of Victorian England. Being a personage agreed with him. It is recorded that in his early days in Australia he was one of the least impressive lecturers, but by careful application he developed towards that perfection in the art of exposition which he afterwards attained. His social gifts won him a wide popularity. He helped to lay out the first golf course in South Australia, at Glenelg, played golf, a game at which he was good, painted in water colours and enjoyed himself. Bicycling came into vogue during his Australian days, and he loved bicycle tours and picnics during the long lazy summer vacations by the sea. It was a pleasant life for a man with a zest for the good simple pleasures of the open air. More important for science, he became interested in experimenting, of which he had had little or no experience in England. Following Röntgen's great discovery in 1895 he set up the first X-ray tube to operate in Adelaide, possibly the first in Australia. He still, however, made no attempt to carry out any original investigation, and no doubt to those around him it might well have appeared that he was destined to lead a pleasant and useful life as a popular teacher and good friend in the Adelaide community, content with his local fame. At the age of forty-one he had amassed a long experience of teaching the fundamentals of physics and had developed a keen critical sense: he was a clear and mature thinker but had produced nothing that could be called research. This maturity and long training in exposition were of immense advantage when he turned to discovery. In January 1904 the Australian Association for the Advancement of Science met in Dunedin, New Zealand, and Bragg was confronted with the task of giving the presidential address in the section dealing with astronomy, mathematics and physics. At the time the early discoveries in radioactivity were holding the attention of the world of physics and work on the electron was being actively pursued in the Cavendish Laboratory and elsewhere. Exciting discoveries in the new fields were pouring out. In particular, Lenard's second famous paper on the absorption of cathode rays by matter had just appeared. In his address Bragg reviewed the work on radioactivity and on the properties of the electron and, in consequence, he became greatly interested in the question of the penetration of matter by elementary particles. At the time the atom was held to consist either of electrons widely dispersed in a sphere of positive electricity (J. J. Thomson) or of widely spaced 'dynamids' (Lenard), a dynamid consisting of a positive and a negative charge, closely associated. This conception of a neutral pair was one that Bragg used later in another connection. In either picture there would be comparatively strong, highly localized electric forces separated by large spaces in which the forces were feeble. The scattering of the beam of electrons in Lenard's experiments was put down as the effect of a series of random deviations due to passages close to the force centres. (1) The number of α particles penetrating a given distance does not alter much with the distance until a certain critical value is passed, after which there is a rapid fall. (2) The energy of the α particles penetrating a given distance gradually decreases as the distance is increased, and dies out at the same critical value.' The passage is quoted, since it shows the typical Bragg clarity and precision, the power to put in the simplest language the essence of a novel problem. Until he had reduced his thoughts to the state where simple and direct expression was possible he was not at ease. * See W. H. Bragg, Studies in Radioactivity, London, 1912. A few months after the address some radium bromide was placed at his disposal, and, assisted by Kleeman, he began his classical researches on the range of the alpha particle and the closely allied questions of the ionization produced by the particle and of the stopping power of substances. Using as detector an electrometer which measured the ionization produced in a thin slab of air between a gauze and a plate, he established the sharply defined range of the alpha particle and the variation of the ionization along the path, obtaining with radium which had come into equilibrium with its products the four ranges, corresponding to the particles from radium, radon, radium A and radium C, according to Rutherford's theory, which was thus confirmed. With Kleeman he found that the 'stopping power' of matter was approximately proportional to the square root of the atomic weight. 'Considering the complexity of the phenomena involved in the absorption of an α particle by matter, it is a matter of interest and also of practical convenience that such a simple rule should hold roughly over the whole range of the elements. '* He corresponded freely with Rutherford about the work on the α particle, whose properties they were pursuing independently along different lines. * Rutherford, Chadwick and Ellis, Radiations from Radioactive Substances, Cambridge, 1930. He also carried out fundamental work on the ionization produced by α-rays and on the properties and behaviour of the secondary electrons expelled from matter by incident β and γ radiations, electrons to which Bragg applied the name β-rays, or secondary β-rays. In some of the experiments on these β-rays he had the collaboration of Madsen, now Sir John Madsen. The experiments on the secondary electrons expelled by γ-rays were important for the development of Bragg's theoretical views. They established that the velocity of the β-rays depended not upon the intensity but upon the 'quality' of the γ-ray, increasing with the penetrating power of the latter, and that the velocity was independent of the atom from which the γ-ray was expelled. These results were shown by Sadler and others to apply to the β-rays produced from matter by incident X-rays. It was largely on experiments of this kind that Bragg based his views that X-rays were corpuscular in nature, views which his own fundamental experiments later showed to require modification. The paradoxical coexistence of particle and wave properties was a favourite theme of Bragg's, to which we shall return. The fundamental researches carried out, in quick succession, in Adelaide between 1904 and 1908 speedily established his name throughout the world of physics as an original investigator of the first rank. He was elected a Fellow of the Royal Society in 1907, less than three years after the reading of his first original paper, Rutherford being his proposer. It was inevitable that he should be called to a chair in the old world. In 1908 he received the offer of the Cavendish professorship of physics at Leeds, which brought him back to England. During his twenty-two years in Australia Bragg had identified himself with the life of the community in which he lived and had established himself as a good man, a great teacher and a firm friend. He had many ties with Adelaide, and had thoroughly enjoyed life there. In after days he always spoke with the greatest affection of South Australia. At Leeds Bragg was, at the beginning, fully occupied with organizing the teaching at the laboratory, and naturally, for a time, he did comparatively little experimental work. He developed and defined his view that X-rays and γ-rays were of a corpuscular nature, the lack of deflection in a magnetic or electric field being explained by the hypothesis that an elementary ray was in the nature of a neutral doublet - 'an electron which has assumed a cloak of darkness in the form of sufficient positive electricity to neutralize its charge' - to use Bragg's own typically arresting phrase. Although this picture can no longer be deemed satisfactory it did account for many properties of the radiation which are embodied in the quantum theory. In particular Bragg insisted that many of the experimental facts seemed to show that an elementary X- or γ-ray was a definite and concentrated unit rather than a spreading pulse or wave, as indeed they do. The doublet theory was also successful in explaining in a general way certain aspects of the conversion of cathode rays into X-rays and of the release of electrons by X- and γ-rays. It had its usefulness in concentrating attention on the particle aspect of the radiations, which plays so prominent a part in modern theories. In the course of his work on secondary radiation Bragg was led to the view that the ionizing effect of the X-rays is an indirect one, due to the secondary electrons released by the primary X-ray. He was the first to insist on this important fact, and he supported his contention by experiments carried out in conjunction with H. J. Porter, which were published in 1911. Laue's discovery, with Friedrich and Knipping, announced in June 1912, that X-rays could be diffracted by passing through crystals, caused a sensation in the physical world. Bragg's interest was at once captured, and it may be of interest to quote what he wrote in Nature in November of that year: 'Dr Tutton suggests that the new experiment may possibly distinguish between the wave and the corpuscular theories of the X-rays. This is no doubt true in one sense. If the experiment helps to prove X-rays and light to be of the same nature, then such a theory as that of the 'neutral pair' is quite inadequate to bear the burden of explaining the facts of all radiation. On the other hand, the properties of X-rays point clearly to a quasi-corpuscular theory, and certain properties of light can be similarly interpreted. The problem then becomes, it seems to me, not to decide between two theories of X-rays, but to find, as I have said elsewhere, one theory which possesses the capacity of both.' The theory of the diffraction spots which Laue obtained by consideration of a three-dimensional grating is somewhat complicated, involving as it does the consideration of interfering wavelets in three-dimensional space. The same year W. L. Bragg gave a much simpler interpretation of the phenomena, by considering the reflection of waves from parallel layers of atoms or diffracting points, each typical set of parallel crystal planes acting as a reflecting surface for radiation whose wavelength fulfilled the Bragg law nλ = 2d sin θ, where d is the distance between parallel crystal planes and θ is the glancing angle, i.e. the complement of the angle of incidence. The more densely populated crystal planes gave, speaking generally, stronger reflections, so that planes with higher indices were not strongly represented. W. H. Bragg at once took up, with his son, the experiments on the reflection of X-rays which this interpretation suggested, and early in 1913 there appeared in the Proceedings of the Society the first joint paper, which founded the science of crystal analysis by means of X-rays. Up to the beginning of the first Great War in 1914 five further classical papers were produced by Bragg, in one of which, that on the structure of diamond, he had the collaboration of his son. Among other subjects dealt with were the general technique of the X-ray spectrometer; the characteristic absorption of the different radiations and its effects; the structure of sulphur and quartz; and the general question of intensities. An investigation with S. E. Peirce led to the Bragg-Peirce law, according to which if we keep to frequencies below the band at which the absorption discontinuity takes place, the absorption coefficient per atom is proportional to the fourth power of the atomic number and to the 5/2 power of the wavelength. * In these early experiments Bragg made use of the ionization chamber to detect and measure the rays. His earlier work had taught him how to overcome the difficulties connected with this type of measurement and he and his son were strikingly successful with the ionization spectrometer. The photographic method had already been used by H. G. J. Moseley in his classical researches, but it was only later that Bragg adopted it. * The value of the exponent is usually taken as 3, instead of 5/2, to-day. The work of Bragg and his son Lawrence in the two years 1913, 1914 founded a new branch of science of the greatest importance and significance, the analysis of crystal structure by means of X-rays. If the fundamental discovery of the wave aspect of X-rays, as evidenced by their diffraction in crystals, was due to Laue and his collaborators, it is equally true that the use of X-rays as an instrument for the systematic revelation of the way in which crystals are built was entirely due to the Braggs. This was recognized by the award of the Nobel prize for Physics in 1915 to them jointly 'pour leurs recherches sur les structures des cristaux au moyen des rayons de Roentgen', and a further formal acknowledgment was the appearance in Leipzig, in 1928, of a collected reprint, in German translation, of the early papers, under the title Die Reflexion von Röntgenstrahlen an Kristallen: grundlegende Untersuchungen in den Jahren 1913 und 1914 von W. H. Bragg und W. L. Bragg. The outbreak of war in 1914 found Bragg hard at work at Leeds, where all his early experiments on crystal structure were carried out. He was a leading figure in the university there, and occupied the office of Pro-Vice-Chancellor. He continued his X-ray work into 1915, publishing, for instance, a paper on the spine1 group of crystals. In this year he was appointed Quain Professor of Physics at University College, London, but by then he had become involved in war work. The Board of Inventions and Research was instituted in July 1915, for the purpose of giving the Admiralty expert assistance in organizing and encouraging scientific effort in connection with the requirements of the Naval Service, and Bragg was an original member. The submarine menace was becoming acute and the use of acoustic methods for locating underwater craft came up for discussion before the Board, with the result that Bragg was put in charge of research on the detection and measurement of underwater sounds, within the Anti-Submarine Division of the Admiralty. In the first instance he was, in April 1916, made Resident of Research at the Admiralty experimental station at Hawkcraig. After many troubles, largely within the Admiralty (see J. J. Thomson's Recollections and Reflections), a laboratory was built for him at Parkeston Quay, Harwich, where Bragg started work in 1917, having under him, among other physicists, A. O. Rankine. The hydrophone or underwater receiver, developed by Bragg and his team, rendered great service in the war against the submarine. The instrument was afterwards simply described by Bragg in his World of Sound, a book founded on his first course of Christmas Lectures at the Royal Institution, and in two lectures of which an account is given in Engineering for 13 June 1919. During the course of the experiments and research on anti-submarine work principles were established and methods, as well as apparatus, devised which were of great service. It was probably in acknowledgment of his war work, as well as of his scientific eminence, that Bragg was made a C.B.E. in 1917 and was knighted as a K.B.E. in 1920. In the same year, 1920, he was made an Honorary Fellow of Trinity College, Cambridge, a distinction that gave him great pleasure. The war over, Bragg took up his work as Quain Professor of Physics at University College, London, and promptly started research there. He gathered about him several young research workers, among whom Backhurst may be mentioned, and founded that school of searchers after the secrets of crystal structure which later flourished at the Royal Institution. In 1921 Shearer and Astbury joined him, and shortly after Müller and Miss Yardley (Mrs Lonsdale) appeared. In those days Bragg was himself actively experimenting with his own hands, as well as directing research: he was seated at his spectrometer whenever he got the chance. At the beginning of his work at University College he still used his first well-tried weapon, the ionization chamber, as detector, but gradually gave it up, for most purposes, in favour of the photographic plate. The equipment at University College was somewhat scanty at first and Bragg and his students, Müller and Shearer in particular, set to work to develop it. Continuously evacuated X-ray tubes, both hot wire and gas filled, were introduced and a self-rectifying gas tube was evolved, which gave useful service for many years. In those days vacuum pumps had not reached their present state of efficiency and hot wire tubes were rather trouble-some. The work was supported by generous grants from the Department of Scientific and Industrial Research, which were more than justified by the results. The University College period was notable for the first attack on the structure of organic crystals. For much of this work Bragg employed the powder method, whereas hitherto he had worked with single crystals. He embodied his results on naphthalene and naphthalene derivatives in his presidential address to the Physical Society in 1921, having been elected to the presidential chair in the previous year. He worked on the assumption that the benzene or naphthalene ring is an actual structure, which preserves its general form and size from compound to compound and, to the satisfaction of the organic chemist, his results justified this hypothesis. This work was the starting point of the series of investigations on different classes of organic compounds which he afterwards directed at the Royal Institution. He also worked out the probable structure of ice, and at an annual dinner of the Alpine Club exhibited a model, which, being made of soft dental wax, proved itself by wilting as the evening grew warmer. In 1919 occurred an event, apparently insignificant, that was to have a profound effect on Bragg's life - he gave the Christmas Lectures ('A Course of Lectures adapted to a Juvenile Auditory' as the old phrase runs) at the Royal Institution. The title of the course was 'The World of Sound' and it not only established Bragg's name as a popular lecturer but also showed the originality, the personal qualities, which he could bring to an apparently hackneyed subject. He classified his subject on new lines, the six lectures being entitled 'What is Sound?' 'Sound and Music', 'Sounds of the Town', 'Sounds of the Country', 'Sounds of the Sea', 'Sounds in War'. 'Sounds of the Country' in particular, showed his love for, and careful observation of, nature out of doors. His powers of simple exposition, his personal and persuasive style, his affection for young people - all became known to a wide circle. It may be worth while to quote the opening sentences from the book that embodied these lectures, as they give some idea of his style. 'All around us are material objects of many kinds, and it is quite difficult to move without shaking some of them more or less. If we walk about on the floor it quivers a little under the fall of our feet; if we put down a cup on the table, we cannot avoid giving a small vibration to the table and the cup. If an animal walks in the forest, it must often shake the leaves or the twigs or the grass, and unless it walks softly with padded feet it shakes the ground. The motions may be very minute, far too small to see, but they are there nevertheless.' The words are simple and colloquial, with no straining after effect, but they are striking and tell us at once that we are in the presence of one who was a lover of nature and a master of simple, direct and captivating exposition. It was, perhaps, partly as a result of this course of lectures that, when on the death of Sir James Dewar in 1923 the headship of the Royal Institution fell vacant, Bragg was elected to succeed him under the complex of titles Fullerian Professor of Chemistry in the Royal Institution; Director of the Laboratory of the Royal Institution; Superintendent of the House; and Director of the Davy-Faraday Research Laboratory. The Fullerian Professorship of Chemistry is a traditional title which carries somewhat indefinite duties; the Laboratory of the Royal Institution and the Davy-Faraday Research Laboratory are run more or less as a whole, the Managers of the Institution administering the Davy-Faraday funds and the Resident Professor in the Royal Institution being also the Director of the Davy-Faraday Laboratory. The superintendence of the House entails the general responsibility for the maintenance and smooth running of the Institution which the head would naturally be supposed to exercise; the Davy-Faraday Laboratory was founded by Dr. Ludwig Mond under a deed of trust for the carrying out of original research. The whole complicated position is one that could only exist in England, but it works, though whether it works better than a simpler and more unified administration would do has not been proved. Dewar was over eighty years old at the time of his death and there was much to be done in the way of reorganizing, for instance, the work in the Davy-Faraday Laboratory, which Bragg promptly directed to problems of crystal structure. He brought with him from University College Müller and Shearer, who were mainly responsible for the actual installation of the new type of apparatus needed for the X-ray methods. They also continued the work on long-chain compounds which they had begun at University College, while Shearer further worked on the theory of space groups. The work which Müller carried out on the fatty acids was typical of the tendency towards the investigation of organic structures which the laboratory took under Bragg's direction, while his son at Manchester concentrated on inorganic crystal structure. Among the early workers in the laboratory may be mentioned J. D. Bernal; R. E. Gibbs, who did not pursue organic compounds but worked on the structure of quartz; Miss Yardley, afterwards Mrs. Lonsdale, who became one of the pillars of the laboratory; Miss C. F. Elam (Mrs. Tipper), known for her work on metals; W. T. Astbury, who came from University College and afterwards investigated the crystal structure of the products of the living body, such as hair and horn; and J. M. Robertson, somewhat later, who worked on the crystal structure of anthracene and naphthalene, and applied the methods of Fourier analysis to deduce crystal structure from intensity measurements. There are other distinguished names among those who spent a short time in the laboratory. It speedily became a world-famous centre of research. Bragg was no longer able to spend as much time as formerly at his own researches, but the work of the laboratory was an informed whole which in all its features gave evidence of his wise guidance and prescience. One of Bragg's first tasks at the Institution was to give the Christmas Lectures. He chose as his title that of the famous poem of Lucretius, 'Concerning the Nature of Things', and talked about atoms, gases, liquids and crystal structure with masterly simplicity and inimitable charm. He always gave the impression that he thoroughly enjoyed addressing the 'Juvenile Auditory' for whom these lectures were traditionally intended. On two other occasions, namely at Christmas 1925 and Christmas 1931, he gave the lectures on 'Old Trades and New Knowledge' and on 'The Universe of Light'. The 1925 discourses gave evidence of his appreciative interest in the industrial aspects of science which he later emphasized by taking 'Craftsmanship and Science' as the subject of his Presidential Address at the British Association at Glasgow in 1928. Bragg brought to the social life of the Institution a charm and suavity which rapidly won all hearts. Lady Bragg, with a kind-heartedness whose sincerity was apparent, and with a graciousness free from all affectation, was an ideal hostess at the mixed gatherings that thronged the Braggs' private apartments after the Friday evening discourses. Their daughter, Gwendolen, an accomplished artist, some of whose drawings appeared in Bragg's Universe of Light, lived with them, and Lawrence Bragg was a frequent visitor. The unity of the family was felt outside the walls of their official residence. Lady Bragg's death in 1929 after much suffering was indeed a heavy blow to Bragg and a source of sincere grief to all those who had come to know her at the Royal Institution. After her mother's death Gwendolen Bragg became her father's closest companion, both as the centre of his personal home life and as hostess at the many friendly assemblies, great and small, that characterized the Institution. On her marriage in 1932 to Alban Caroe she gave up residence at the Institution for some eighteen months, but then returned and, with her husband, lived there for the rest of her father's life. Between Bragg and his daughter there existed a warm affection and comradeship which illuminated both their lives. 'We had grand times together', she wrote to a friend. An essential part of Bragg's family life was the country cottage at Chiddingfold, Surrey, which he purchased in 1923. Hither he would retire for relaxation during holidays and at week-ends, and here he would entertain those working at the Royal Institution in an atmosphere of intimacy which brought them very close to him. They, too, felt that they were part of the family. Many important changes took place in the Institution under Bragg's rule. In 1929 an extensive reconstruction of the Royal Institution house, which lasted two years, began. It had become clear that the lecture theatre did not comply with the requirements for safety, especially against fire, demanded of a building to-day, and the complete reconstruction of the interior of the theatre and the provision of proper exits involved a number of alterations which were embodied in a comprehensive architectural scheme. Bragg took a leading part in the negotiations and the liberal contributions that were made to the expenses of the undertaking were largely the results of his persuasive charm. A further reconstruction took place in 1936, in which he was again active. Many notable additions were made to the equipment of the Davy-Faraday laboratory: in particular a giant X-ray generator, of a new type designed by Müller, was built and installed in the Institution. This possessed a rotating hollow target, with water cooling, and dealt with an input of fifty kilowatts. A smaller tube with an input of five kilowatts was also erected. The great intensity obtainable with these tubes very much accelerated work in general by permitting very short exposures and rendered feasible certain experiments which otherwise could not have been successfully carried out. Thus high dispersion was achieved by using much larger distances from object to plate than are practicable with weaker sources, and such experiments as those of Müller on the effect of compression on the lattice spacing of certain organic compounds were made possible. In spite of the many calls upon his time which his name and fame entailed, and of advancing years, Bragg kept well abreast of physical thought and keenly welcomed all advances. Even when he did not pretend to have mastered all the mathematical intricacies of the latest developments he was able to grasp very quickly the more important implications and to give them a new turn, which not only simplified them but set them in relation to the general advance of science. In 1928, for instance, he arranged for Schrödinger to deliver a course of lectures at the Institution on wave mechanics, then a very recent development. (Incidentally it is said that an enthusiastic, but unmathematical, yachtsman appeared at the first lecture, hoping to learn something about sailing in a rough sea.) He gave an introductory lecture as preparation for the course, in which he returned again to the wave and corpuscle dichotomy. He referred back with pleasure and some pride to his old experiments with Kleeman and Madsen, which have already been mentioned, saying, 'I may say, I think, that in these experiments we were, though unwittingly, carrying out Einstein's suggestion that the corpuscular hypothesis deserved careful exploration . . . It is true, however, that I thought of the X-ray and γ-ray problems as distinct from that of light.' He ended on a typical thought, typically expressed, 'When the picture is finally clear there will no doubt be atoms in it, electrons, wave motions, energies, momenta and so on. But have we got them all rightly joined up? Perhaps wave motion belongs to more than the photon or to something else than the photon? We can only wait.' No doubt he was thinking of the experiments of Davisson and Germer and of G. P. Thomson, indicating the wave nature of the electron, of which accounts had just appeared. On more than one occasion, while at the Royal Institution, Bragg showed his extraordinary power of taking up a new subject, adding something to it, and then laying it down again. A particularly good example is offered by his work on liquid crystals. In connection with the Faraday Society's discussion on this subject, held at the Royal Institution in 1933, he became interested in the phenomena of smectic crystals, and he then showed, in an extremely simple and elegant way, that the static arrangement of a number of equidistant parallel layers, without rigidity, was a set of surfaces formed in successive layers around an ellipse, having as lines of discontinuity the ellipse itself and a hyperbola in a plane perpendicular to it, each curve passing through the focus of the other. In short, he explained the phenomena in terms of the cyclides of Dupin. He never seems to have concerned himself much with liquid crystals after his lecture on the subject at the Royal Institution in November 1933. The case serves to show how he retained his rare geometrical sense and could apply it at will. Late in his work at the Institution Bragg came to the conclusion that it was desirable to have some fundamental theoretical work proceeding at the same time as the experimental investigations and a systematic mathematical attack on details of the methane spectrum was made by H. A. Jahn, working sometimes in collaboration with W. H. J. Childs. This kind of work was far from anything that Bragg himself ever did, but it had his warm support and encouragement. * A simple account by Mrs. Lonsdale of the extra reflections may be found in Engineering, pg. 254, 27 March 1942. By 1930 Bragg had become not only one of the great figures of English science but also something of a national figure. In that year the Royal Society bestowed on him the Copley medal, its senior award. He had received the Rumford medal in 1916. He was an honorary doctor of some sixteen British and foreign universities, and a member of the leading foreign societies. In 1931 he received the Order of Merit. If any great scientific body had a ceremonial lecture to be delivered, Bragg was asked to act, and he generally consented if he found it possible. Whether he enjoyed delivering addresses it is hard to say. Beforehand he appeared to feel some diffidence and certainly the utterance that seemed to come so easily and so spontaneously was the fruit of more labour and thought than the audience often suspected. I think that once on his feet he did enjoy it, as a man enjoys doing anything in which he is supremely competent. Afterwards he received the compliments and congratulations with an artless modest pleasure that became him well. He never lost his zest; if he always maintained the interest of his audience it was, perhaps, because he always maintained his own interest. 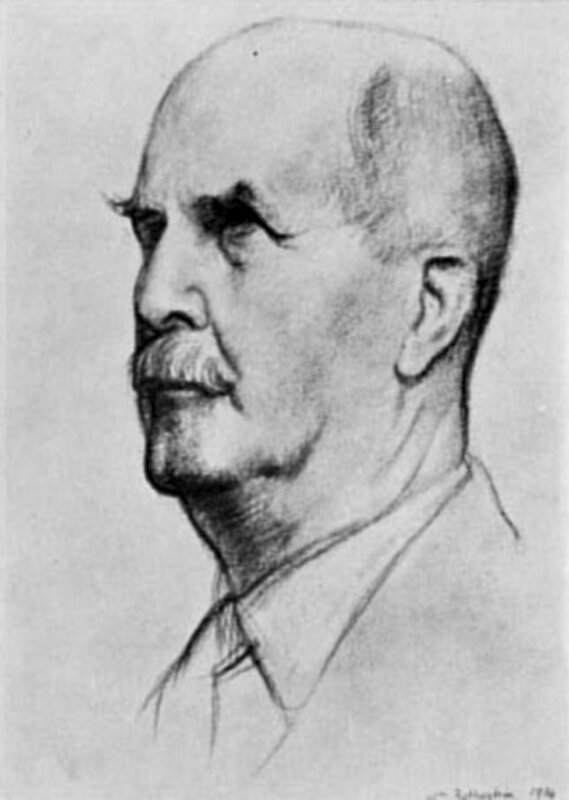 In 1935 Bragg, now seventy-three years of age, was elected to the Presidency of the Royal Society. His reputation, his fine presence, his dignity tempered with geniality, his wide knowledge and his ready sense of the right word made him a complete figure in the Chair. His kindness and ease of access commended him to the younger Fellows; his respect for tradition and his historical sense commanded the confidence of the older Fellows; his close connection with Trinity College oiled many wheels. His kindliness led him to welcome certain ambiguous advances from learned bodies in Nazi Germany, and he did his best to further ostensible plans for an understanding between the two countries which, in his goodness of heart, he took at their face value. The war found him burdened with a variety of heavy duties which he, never sparing himself when the good of the scientific community or of the country at large was in question, allowed to be increased. Soon he was not only President of the Royal Society and responsible for the many duties that attach to the headship of the Royal Institution, but Chairman of the Scientific Committee on Food Policy, Chairman of the Scientific Advisory Committee, and Chairman of the Science Committee of the British Council. He was also a member of the Advisory Council of the Department of Scientific and Industrial Research, and held a number of other appointments, none of them sinecures. Very few men of seventy-seven could have carried out in any fashion the variety of responsible tasks which he discharged with grace, dignity and efficiency. His voice on the wireless service gave pleasure to hundreds of thousands, and he was keenly interested in the teaching of the elements of science to the boys of the Air Training Corps. He even wrote a little book The Story of Electromagnetism to help them in their studies. Naturally he did not feel inclined to embark on a campaign for reforming the whole organization of science in the war-time service of the country, but within the cumbersome, complicated and capricious frame set up by the Government through its peace-time servants he rendered great services. He laid down the Presidency of the Royal Society in 1940, and with it some other duties, but the demands on his services outside his duties at the Royal Institution were still many. With his naturally strong constitution and strong sense of duty he carried on bravely all through the worst period of the war, but his friends were distressed to see how exhausted he was from time to time. He would always make an effort when needed, but it cost him more and more. For some time his heart had been giving him trouble and he endeavoured to avoid physical exertion, while still using his mind like a young man. Reference has already been made to his enthusiastic interest in a new X-ray phenomenon, and as late as December 1941 he was writing in Nature about it. On Tuesday, 10 March 1942, the gallant veteran had to take to his bed; two days later he was dead. Bragg had an astonishing career. Up to the age of forty he never showed any desire to carry out original experiment. He then straightaway embarks upon a perfectly precise and important piece of work and within a few years his name is known wherever physics is seriously studied. He spends some years carrying out a careful series of experiments which can be interpreted to prove the corpuscular nature of X-rays, and he stresses this interpretation. He then himself conclusively demonstrates, by the work with which his name will always be associated, the wave nature of X-rays. He starts life as an extremely shy and retiring youth, never, apparently, quite at home in Cambridge, and in his old age becomes a national figure, at ease in all surroundings, whose personal appeal is known all over England. Yet there is nothing contradictory in his character. Bragg's nature was simple, straightforward and tenacious - incidentally, of course, he was a man of genius. It would never have occurred to him to embark upon research with the object of publishing a paper or papers to impress other people. He waited until he found something that seemed to him to ask for experiment and in the first case he did not come across this until he had trained both his critical faculties and his powers of exposition in the faithful discharge of his duties as a teacher. This long period of apprenticeship probably had a profound influence on his work. It helps to account for his great objectivity and for his power of formulating a problem simply and directly. Bragg's fundamental ideas, as he expounded them, were accessible to any undergraduate. His greatness was shown in their originality and in the skill and perseverance with which he shaped them to well-recognized ends. He was a very great experimenter who never wasted his time on the trivial or hid difficulties under the graceful veils of mathematical obscurity. His hypotheses were stated clearly as hypotheses, his experimental results as experimental results - the former he was ever willing to modify or to abandon as later discoveries might dictate, the latter he knew to constitute knowledge won for all time. His work, like his personality, was simple yet profound, sincere and compelling. Bragg preserved all through his fame many of the more admirable characteristics of youth. He was capable of a warm burst of enthusiasm at any new idea or achievement that appealed to him. He was apt to believe that all men were as sincere and diffident about their own achievements as he was about his own, which occasionally led him to lend support where it might, without disadvantage, have been withheld. But how much better this generosity of outlook became him than a coldly critical attitude would have done! Again, he never shrank from asking for information or advice: he was far too big a man to mind admitting gaps in his knowledge. His warm, simple, persuasive utterance, his personal tone in lecturing which made each member of the audience think that the remark was intended for him, was also more reminiscent of the wise elder brother who was sharing with you the pleasure of a discovery, than that of the great sage who was instructing you. But he was a great sage. Bragg was a man of very strong family feeling, who was never happier than with his children, and, later, his grandchildren. He took a particular pride in the achievements and career of his brilliant son. It was always a delight to his hearers to note the affection that came into his voice when, in lectures, he found occasion to deal with some one or other piece of work which had been carried out by 'my boy'. His unaffected pleasure and surprise at the news of some new high post or distinction awarded to him was very lovable. He was, for instance, obviously overjoyed when Sir Lawrence received his knighthood. The quiet affection that existed between him and his daughter was a source of pleasure to many outside his family circle. There was nothing narrow about Bragg's interests. Reference has already been made to his love of games, and he was always ready to talk of life in the open air. He had a great affection for the sea and was always at his happiest on an ocean voyage, the first day of which seemed to wipe away his cares. He was a lover of simple music and enjoyed playing the old tunes on his flute, the sound of which, in the old days at the Royal Institution, could often be heard coming from his study at the evening hour. In his younger days he had been a very good draughtsman and painter in water colours, and he knew more than a little about pictures. His range of reading was wide, both among the English classics and the moderns. With all this, he was an exceedingly good conversationalist and a first-rate impromptu speaker. Nature had given him a fine presence. In any company he was an unmistakable figure. Religion was a strong influence in Bragg's life. He had no strong dogmatic views but he had a simple and genuine piety and was an enemy of unbelief, as he was of loose talk of every kind. He was not comfortable at any discussion, however serious and philosophical, that touched on the weaker side of man's nature. There were many things whose existence he preferred not to acknowledge. In religion, as in other matters, he was tolerant of the views of those who sincerely held views different from his own. Something of his own belief will be found in his address on 'Science and Faith'. There was, we like to think, something peculiarly British about Bragg. His attitude towards physics was that characteristic of the great experimenters of our land, especially his strong pictorial sense. He was a lover of the traditions, especially those of the great institutions with which he was connected. His lack of pedantry, his gift for popular exposition, his strong feeling for the craftsman in factory and workshop are all characteristics which he shared with Faraday, with Tyndall, with J. J. Thomson. He was an ornament, not only of English science, but of English learning, a great teacher and a good man, whose death came as a personal loss to all those who knew him. With him went an outstanding representative of a great period of English physics.